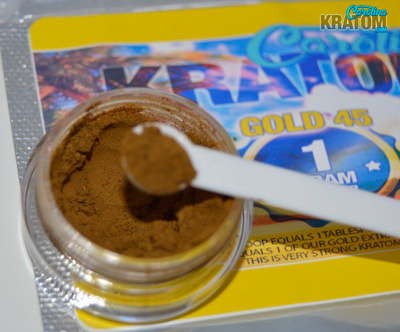 The Gold 45 extract has quickly become a customer favorite here at Carolina Kratom. Gold 45 extract is for someone that's looking for a great quality extract that requires only a fraction of material for results. 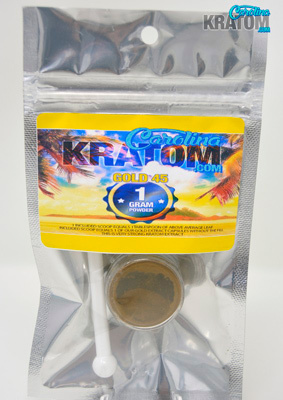 Carolina Kratom's Gold 45 extract comes in a 1 gram size container and a small 100mg scoop is included. This Kratom extract is conveniently packaged. For those familiar with Carolina Kratom's Carolina Gold capsules this Gold 45 is its main active ingredient (1/10th of a gram). You'll be sure to find the Gold 45 extract a delight. 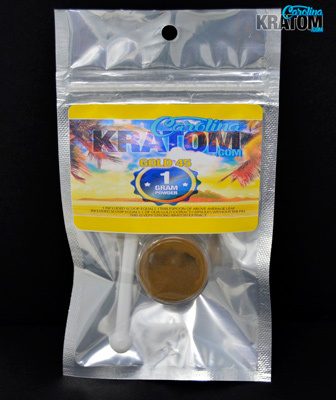 This Gold 45 extract sold by Carolina Kratom has customers reporting it's excellent pain relieving qualities. That is due to the extraction method that focuses on those specific alkaloids also giving Gold 45 it's golden hue. Gold 45 extract has a overall 45% mitragynine content. Therefore not only have Carolina Kratom's customers raved on the pain relieving characteristics but have also mentioned a general sense of well being and mood boost. It's even been reported a decrease in anxiety and depression was felt. Carolina Kratom's Gold 45 extract is a sure hit! This is by far my new favorite. Love the Gold 45!!! Good but extracts are not my thing. Gold 45 from Carolina Kratom is number 2 on my top 3 extracts from ANY vendor. Highly potent at approximately 45% alkaloid this extract works best when mixed into your regular dose! And a single white scoop to whatever you are taking and you will be amazed at how well this extract works on pain. It gives your mood a good boost as well. Love this stuff! Eh, I'm a huge fan of golds in general but I didnt think this was worth the price. Don't go by my review, see for yourself! A lot of people love this. I'd much rather spend the 27 bucks on regular powder. Comes with 10 doses. You can take this under the tongue and let it dissolve. Or you can mix this with other powders. I like mixing it. Not taking this then another powder but physically mixing the entire dose then taking a drink then pouring the dose in. I was expecting something spectacular, instead I got average. Some of Carolina's extracts are wonderful! This isn't one of them. However, I will try it again but with a different blend. Amazing, amazing, amazing! Carolina Kratom's Gold 45 helps my pain and mood EVERY time! This extract is very strong and very pain relieving. I ordered it when I was dealing with pain associated with an abscessed tooth and it didn't disappoint. Overall, it was a great mood boost and very effective for pain. Highly recommend this extract. Super extract! A must have from Carolina Kratom! Omg ! Carolina Kratom is the best ! This one right here is friggin awesome ! Great mood lift, pain relief, anxiety is gone ! Love it ! Gold Bali stands alone as a most excellent blend, but Carolina Kratom's new 1 gram powder Carolina 45 is the finest extract to be offered. One special scoop, taken alone sublingual or added to a reduced amount of your favorite dose, provides hours of relief from pain, depression, or anxiety with special energy and focus. It's pure heaven, served by each tiny spoonful. If you enjoy a truly fine extract, you owe it to yourself to add this one to your stock. Oh this is the bomb!! This gold 45 is beyond amazing !! Be careful taking this at night , tho ! Try this !! You won't be disappointed!! Love love love CKs gold 45! One little scoop melts my pain away quickly! One of the best extracts I’ve ever had. One tiny little 100mg spoon(included) and your good to go. This is an excellent full spectrum extract.